Whiteman Park is a unique recreation and conservation reserve that covers nearly 4,000 hectares of natural bushland and leisure facilities in Perth’s northern suburbs. With a large variety of birdlife, wildlife, a motor museum and equestrian facilities, Whiteman Park attracts a large number of visitors all year round. To monitor visitor numbers and driver behaviour in the park, engineers have been utilising tube classifiers at each entry point for nearly 20 years. In 2016, Whiteman Park decided to upgrade their monitoring site technology to MetroCount Inductive Loop Classifiers. The existing units would be repurposed to monitor various areas within the park. We paid a visit to Simon Mead – Assets and Infrastructure Coordinator to learn about his traffic monitoring strategy for Whiteman Park. What is your experience with the MetroCount equipment? The Park was doing traffic monitoring when I started on staff back in 1998 and I think had been doing it for several years prior to that. We look at data on traffic entering the park, mostly regarding the volumes of vehicles coming in, types of vehicles and some speed information. We monitor traffic in both directions and by using direction filtering in the MetroCount software, I only include inbound traffic to get accurate visitor numbers. What type of information are you looking to record? We’re mainly focused on volumes to determine visitor numbers. I analyse the monthly averages and the yearly totals for each site, and then look at the cumulative volume over 12 months. Comparing the three entrances we can determine where vehicles are entering the park. To get an idea of visitor numbers, we undertook a manual count of the passengers per vehicle entering the park. Our manual survey produced an average of 3.2 visitors per vehicle which we use as a factor to multiply by vehicles to get year round visitor numbers. Do you notice any seasonal variation in the park with your current monitoring program? We have some consistent patterns of visitation. Mother’s Day is always the busiest day of the year and we have an increase in traffic during the temperate seasons of Spring and Autumn. We see a strong correlation between the weather and our visitor numbers, and the traffic data confirms this. In Perth we are affected by typical 7-day weather cycles, if it rains one weekend, it’s likely to rain the next which can have a significant impact on monthly visitor numbers. What motivated your decision to switch to a permanent system with inductive loops? We have been happy with the data we get from our three sites. Since we’re collecting year-round data anyway, it made sense to invest in a permanent solution. 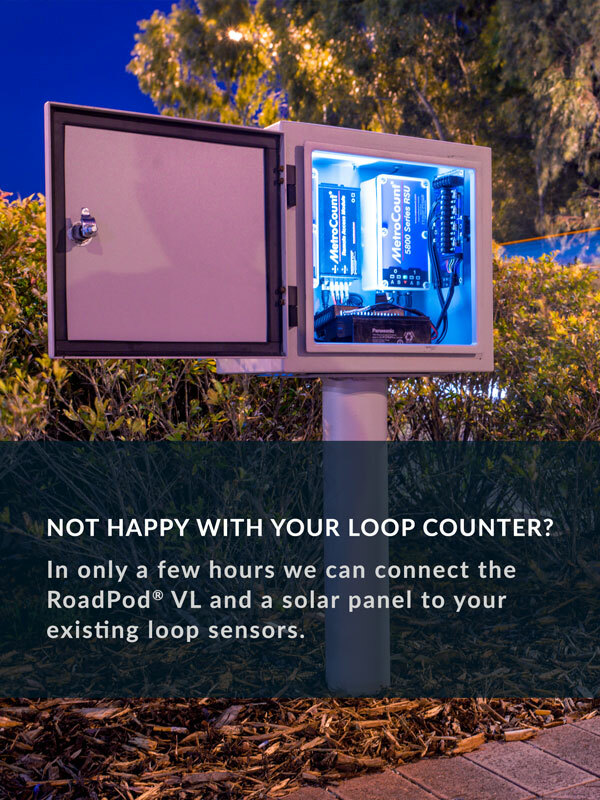 With embedded sensors, we no longer need to regularly visit the sites and change deteriorated tubes. Having data delivered to us on a schedule simplifies our workflow and we are notified directly if there is an issue with a site. Switching out our portable systems means we now have the ability to monitor traffic in other locations. I’m thinking about installing a counter at the entry of our equestrian centre, it all builds the picture of visitor trends in the park and helps us to provide great facilities to the community. *A message we received from Simon Mead after a fire took place at Whiteman Park, in 2014.